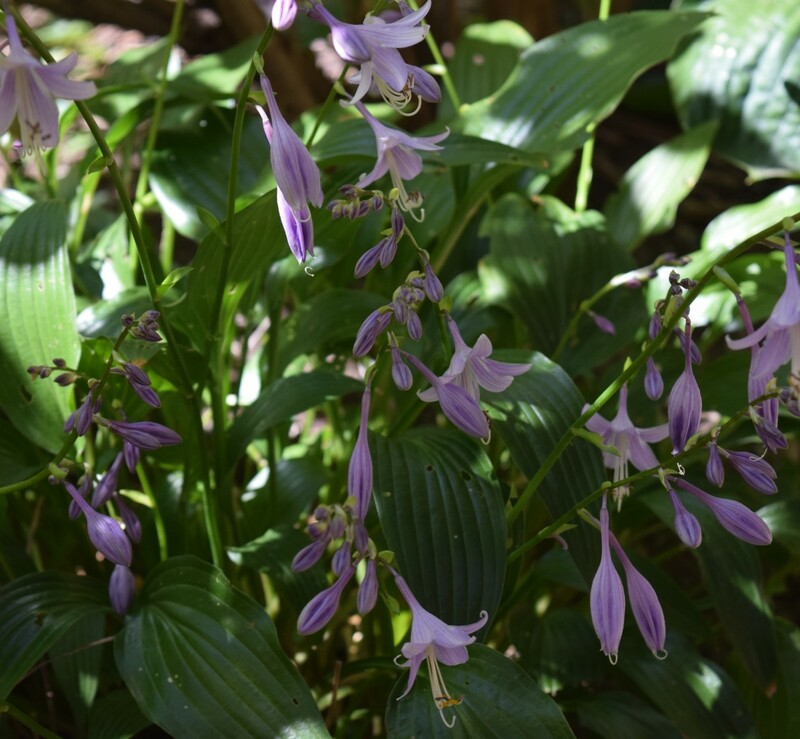 Late blooming Hosta benefits from last fall's compost. 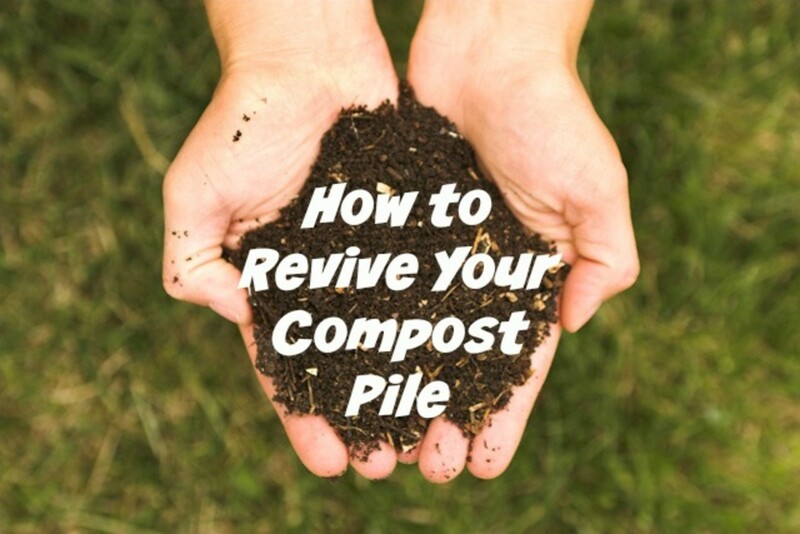 Composting is a fairly easy way to feed the plants in your yard. 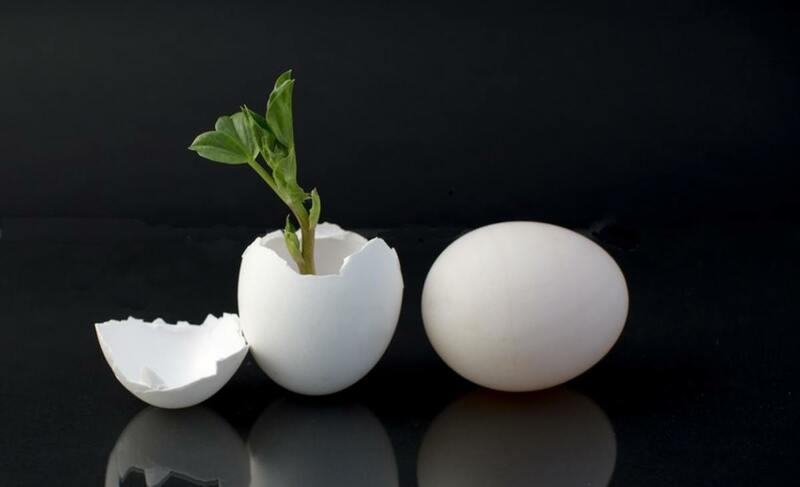 It's a sustainable way to recycle plant material from your garden and return it to the earth. 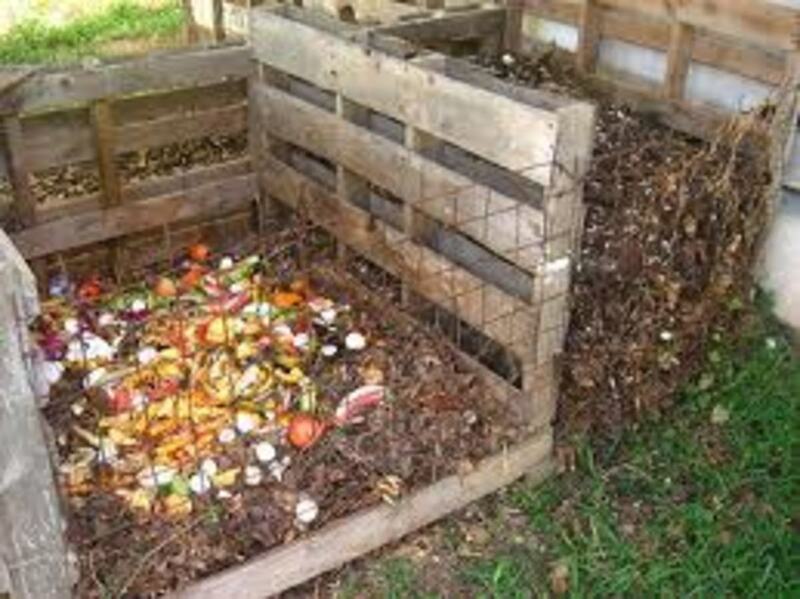 Fall is an excellent time to begin a compost pile. Available in your yard are the two main ingredients: dry, brown leaves and wet (not yet dried up), green plants. The dry leaves you raked up after are great to use. The still somewhat green end of summer plants, like annuals from your containers or flower beds as well as vegetable stalks also make good ingredients for compost. Together, dry and brown and wet and green plant material decompose or break down to form a wonderful soil to feed your garden next year. You will learn how to build a combination container. This simple to make container is a pile within a stake and chicken wire enclosure. The enclosure keeps the materials in the pile together. The pile won't be blown away by wind or washed away by water. 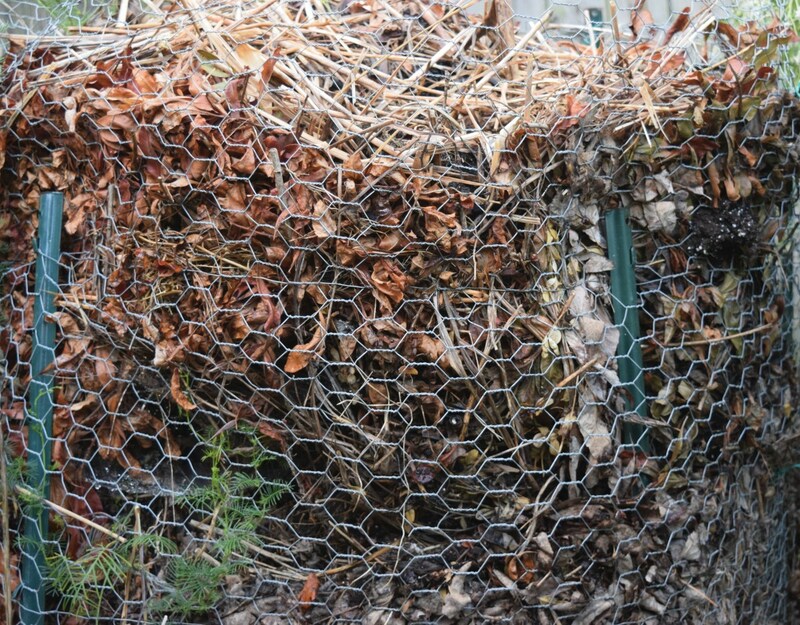 The mesh of the chicken wire is open so that air circulates, assisting the decomposition of the plant material. The pile should be ready to use next fall in time to feed the roots of your garden plants before winter begins. Sturdy garden gloves to protect your hands from the sharp edges of the chicken wire. A long sleeve shirt and long pants will also protect from the edges. Figure out where you want to place it. A mostly sunny location is best as sun and rain help break down the plant material. With the measuring tape mark a three by three foot square. You can lay a metal post at each corner as a marker. The spot needs to be reasonably level. With a shovel scrape off the dirt to make the floor of the container level. Decide where the opening will be. It should be on the side easiest to get to with a wheelbarrow, so you can transfer plant material in and transfer compost out. Leave room for yourself. You will also be standing and working there with your shovel. Sharp edge is folded over three to four inches at one end of the chicken wire roll. At one corner of your square, pound one stake into the ground about six inches deep. To make sure it's steady, give it a good shake. If it's a little wobbly, pound it in some more. Do the same for the other three stakes at the other three corners. 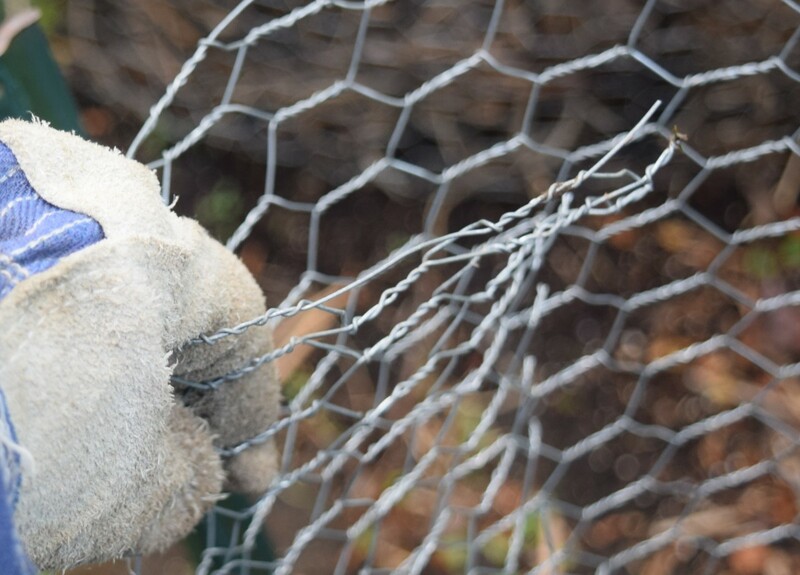 Wearing heavy garden gloves unroll the chicken wire carefully because the ends are very sharp. Fold back the beginning end, top to bottom, about three to four inches. Press by gloved hands or step on it to make the fold. This folded end will be on the inside of the container. Measure about two feet from the folded end. The two feet of wire is the gate or opening. At the spot two feet from the end, slide the chicken wire through the stake from top to bottom. Do this by threading the stake through one hole in the wire at the bottom. Then thread the stake through one hole near the top of the wire. 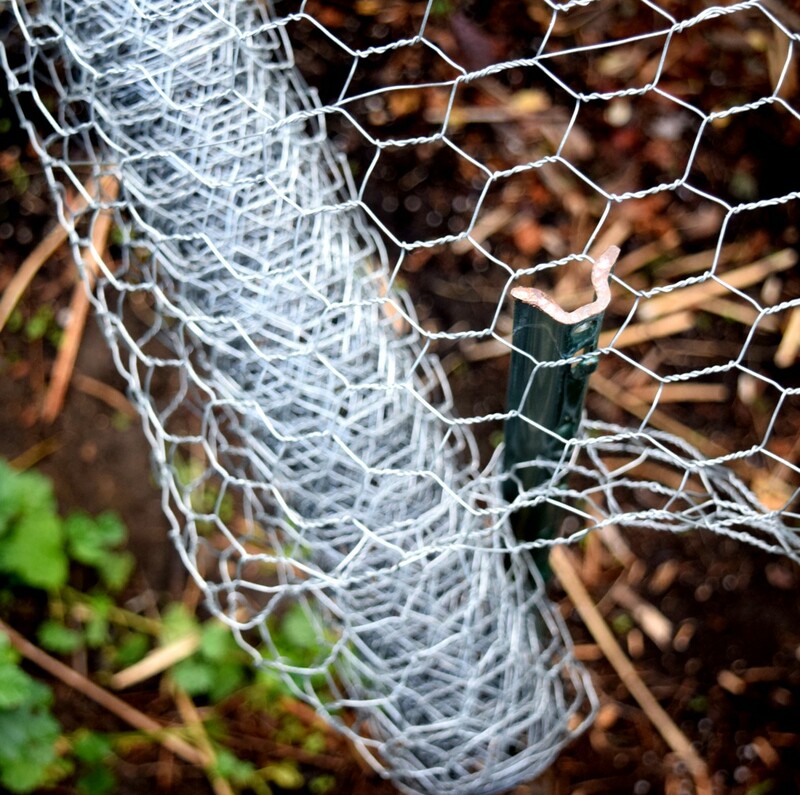 As you unroll the chicken wire, move on to the next stake and do the same thing. Go to the next and then the last one. At bottom of chicken wire roll, thread one hole of wire over stake. The chicken wire is now on the four stakes. Bring the wire to the beginning two foot piece, the gate, and overlap it by one foot. Using the wire cutters, cut off the remaining or left over chicken wire. Press the edge back, top to bottom, three to four inches as you did for the beginning edge, with gloved hands. The pressed edge will be on the inside of the container. This is your “gate.” The gate is used when it’s time to remove the composted material. Use twist ties in several spots top to bottom to fasten the gate pieces together to close the gate. This completes the container. Now it’s time to fill the container up. Ingredients for compost pile: Brown and dry example: leaves. Green and wet example: cilantro, end of season. Two types of plant material need to go into the pile: dry and brown material, and green and wet material. Small twigs – less than three inches long. Annuals that are done for the year. Leaves from plants that are trimmed back like the day lily's long leaves. Stalks of vegetables after they’re done producing food for you. Very long grass when somebody missed a cutting session. Usually cut grass should stay on the lawn to fertilize itself. Kitchen scraps that have been reduced in a mini composting bin (small container with a lid) can be put into the pile when the scraps have turned to mush. Note about the size of plant material: Some items may be too big. For example, a tomato plant stalk could be three to four feet tall. Chop it into three or four pieces with a shovel or use a pruner to make it smaller. 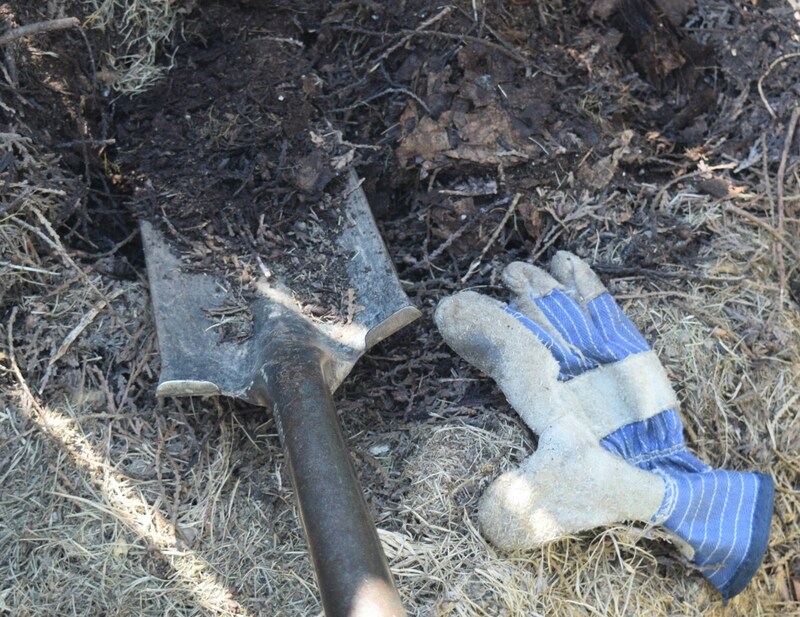 Cutting plant material down to a smaller size will help it decompose faster. Kitchen scraps not broken down: avoid wildlife visitors like rats, skunks and raccoons looking for something to eat. Sick or diseased plants or parts of plants: prevent spreading the problem. 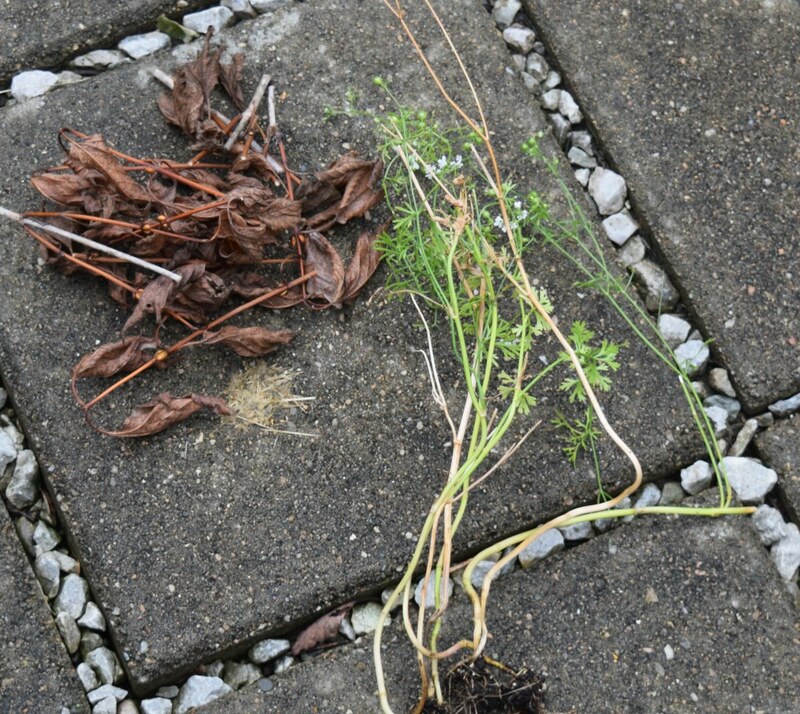 Weeds: seeds may not break down and may survive to pop up later. After it’s stuffed full from fall to late winter, don’t add any more material. Let it rest. Basically this pile can be left alone. If you want, take a shovel or pitchfork to stir it up from time to time. Some people feel that stirring it will help it to decompose faster. Since this container pile will take a year to break down stirring it isn't necessary. Grab a shovel and dig up the mulch! When a year is up, the pile should be smaller than when you began. Since this pile was started last fall, it should be ready to use this fall. Before the current season’s leaves drop, bring your shovel and wheel barrow to the container and open the gate. The top of your pile might have debris on it. Just push the debris aside. Put your shovel in and pull out the most amazing food for your garden! It looks like dirt. Shovel it into your wheelbarrow and throw shovelfuls of it onto the flower beds and anywhere else you want to add nutrients to the soil. Spread it around with the shovel to make sure that all plants in the bed get their fair share. Place it in flower beds and around new plantings. What’s left over can be put anywhere in the garden to feed the roots for next year. Feed trees and bushes too. Food for the roots. 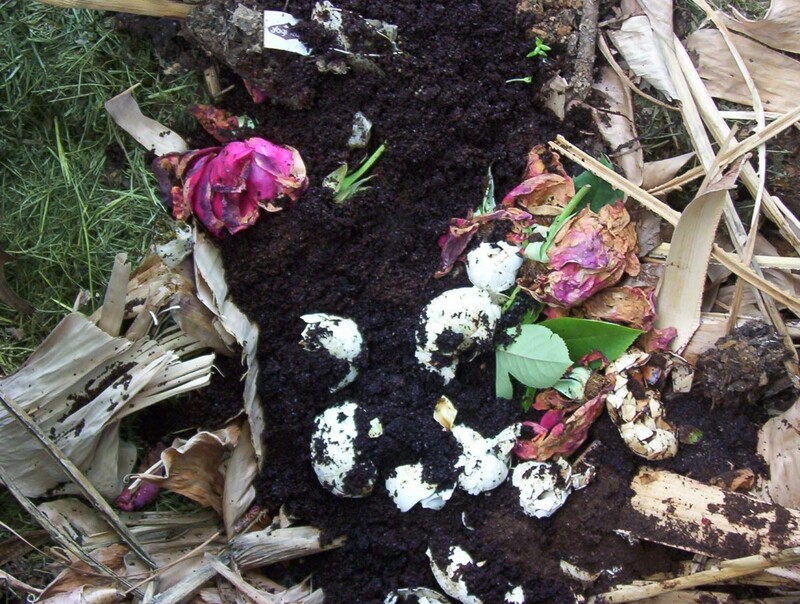 Compost is nature’s own fertilizer. It provides nitrogen, phosphorous and potassium plus some micro nutrients for your plants. Recycles what’s in your own yard. No need to buy fertilizer for garden beds. Cost savings for you. Watch for birds to borrow some of the material for their nests. 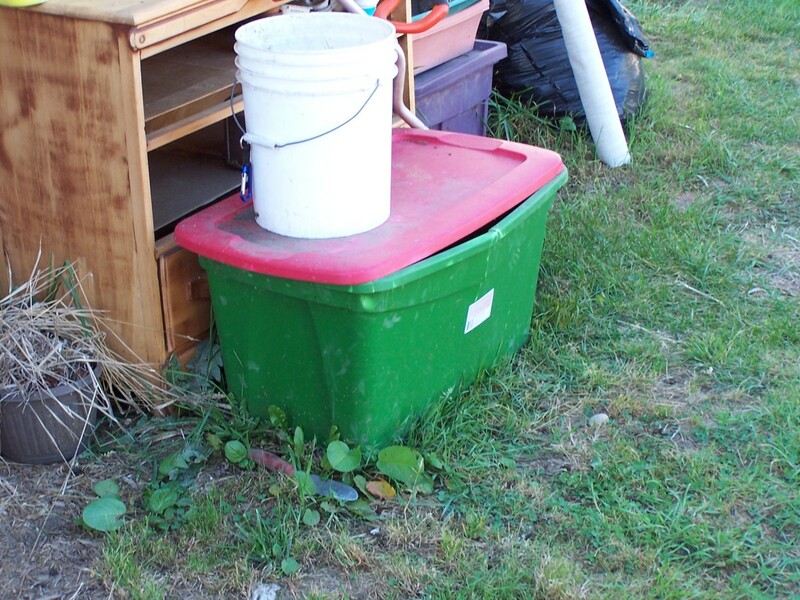 If you want, you can make a second container pile to collect plant material, once the first is full and decomposing. Having a second one allows you to keep throwing in the dry,brown and wet, green plant material all year. You'll have one in process and one ready to go. 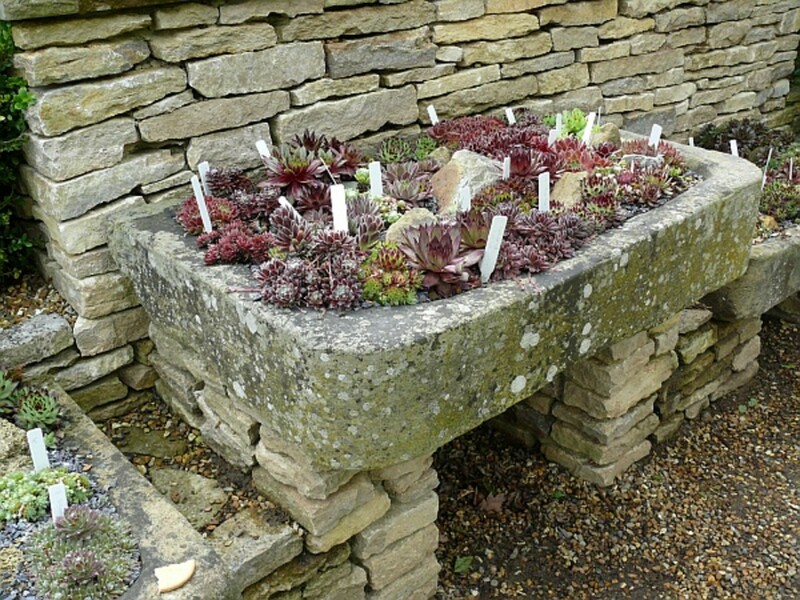 Green gardening with your yard's own recycled plant material. Just open the gate and fertilize!